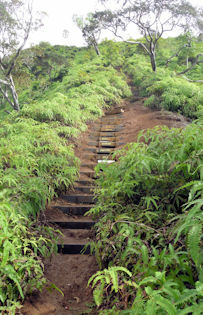 Steps assist the intrepid traveler on a journey up the steep Wiliwilinui trail to the spectacular views atop the summit of the Ko’olau mountains on the Hawaiian island of O’ahu. Hawai’i is the first—and only—state in the nation with a resource plan to achieve all renewable generation. This path started in 2001 with Act 272 setting a renewable portfolio goal. Three years later, Senate Bill 2474 set an enforceable renewable portfolio standard (RPS) of 20% by 2020. The subsequent five years saw various tweaks made to the law, mostly to incorporate energy efficiency measures. In June 2009, an amendment to House Bill 1464 extended and increased the RPS to 40% of “net electricity sales” by 2030. June 2015 saw Governor David Ige signing HB 623, which set an unprecedented 100% RPS by 2045. A year and a half later, the Hawaiian Electric Companies (serving 95% of the state) filed their Power Supply Improvement Plan (PSIP) that laid out a resource plan for attaining all renewable generation by 2045. The plan calls for adding large-scale resources as well as maximizing distributed energy resources. Solari played a key role in writing and communicating this PSIP. In June 2017, Hawaiian Electric filed what is essentially a companion grid modernization plan. This plan proposes to update the energy networks on the five islands served, which paves the path to bring online more renewable resources while maintaining reliability and adding customer choices. Our most recent blog post, The Hawaiian Plan: 100% Renewable Energy by 2045 (and companion position paper), discusses these two plans in greater detail, and addresses the need to communicate with customers. Will future resource planning for increasing renewable penetration require concurrent and complementary grid modernization planning, or even an overhaul of the entire resource planning process? We are researching this very issue, and plan to publish our findings early next year. I went to a movie last week. The movie started with the main actor telling us where to park and how to find the bathroom, and then delayed the movie’s start because patrons were still arriving. We in the audience waited until finally the actor said it was okay to start, than began by introducing himself and thanking us for attending. Then restated the introduction for a couple of late-comers. Okay, that didn’t happen. But it was the way the main speaker at a utility stakeholder meeting I recently attended began. Because nothing relating to the actual meeting was transpiring, attendees stopped paying attention. When the main speaker finally began the actual meeting and got to the point, few were listening. Thus, the connection that could have been garnered from an impactful opening was lost. So, what to do with such peripheral details? First, have them written on a dry-erase board or a handout. Second, enlist someone else to introduce the main speaker, but only if necessary. If the main speaker’s credentials are well known, skip them. And third, begin on time, regardless of attendance. Then start——and end—with impact. To create the strongest connection, make both memorable.